One of the most important parts of the surface mount assembly process is the application of solder paste to the printed circuit board (PCB). The aim of this process is to accurately deposit the correct amount onto each of the pads to be soldered. This is achieved by screen-printing the solder paste through a stencil or foil but also can be applied by jet printing. It is widely believed that this part of the process, if not controlled correctly, accounts for the majority of assembly defects. The most common method of applying solder paste to a PCB using a stencil printer is squeegee blade printing – see images below. The squeegees are the tools used to apply the necessary force required to move the solder paste across the stencil and on to the PCB. They are usually made from metal but can also be made from polyurethane. The speed of travel of the squeegee determines how much time is available for the solder paste to “roll” into the apertures of the stencil and onto the pads of the PCB. Typically a setting of 25mm per second is used but this is variable depending on the size of the apertures within the stencil and the solder paste used. During the print cycle it is important to apply sufficient pressure across the entire length of the squeegee blade to ensure a clean wipe of the stencil. Too little pressure can cause “smearing” of the paste on the stencil, poor deposition, and the incomplete transfer to the PCB. Too much pressure can cause “scooping” of the paste from larger apertures, excess wear on the stencil and squeegees, and may cause “bleeding” of the paste between the stencil and PCB. A typical setting for the squeegee pressure is 0.5Kg of pressure per 25mm of squeegee blade. This is the speed at which the PCB separates from the stencil after printing. A speed setting of up to 3mm per second should be used and is governed by the size of the apertures within the stencil. If this is too fast it will cause the solder paste to not fully release from the apertures and the formation of high edges around the deposits also known as “dog-ears” which can be seen below. The stencil must be cleaned regularly during use which can be done either manually or automatically. Many of the automatic printing machines have a system that can be set to clean the stencil after a fixed number of prints using lint-free material applied with a cleaning chemical such as IPA. The system performs two functions, the first being the cleaning of the underside of the stencil to stop smudging, and the second is the cleaning of the apertures using vacuum to stop blockages. Both stencils and squeegees need to be carefully stored and maintained as any mechanical damage to either can lead to undesired results. Both should be checked before use and thoroughly cleaned after use, ideally using a automated cleaning system so that any solder paste residue is removed. If any damage is noticed to squeegees or stencils they should be replaced to ensure a reliable and repeatable process. This is an important factor to ensure the PCB is held flat against the stencil during the printing process. If the PCB is not fully supported it can lead to printing defects such as a poor paste deposit and smudging. PCB supports are generally supplied with printing machines which are a fixed height and have programmable positions to ensure a consistent process. There are also adaptable PCB supports available of varying designs which mould themselves to the PCB and are useful for double sided assemblies. This is the distance the squeegee travels across the stencil and is recommended to be a minimum of 20mm past the furthest aperture. The distance past the furthest aperture is important to allow enough space for the paste to roll on the return stroke as it is the rolling of the solder paste bead that generates the downward force that drives the paste into the apertures. Solder paste is essentially powdered solder suspended in a thick medium called flux. The flux acts as a temporary adhesive, holding the components in place until the soldering process melts the solder and forms the electrical/mechanical connection. 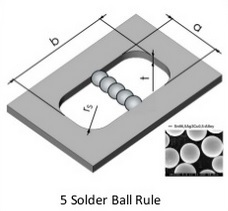 There is a ‘5 ball rule’ which says ideally a minimum of 5 solder particles should span the width of the smallest aperture. Both Tin-Lead and Lead-Free solder paste should be refrigerated while being stored to maintain its shelf life but must be brought to room temperature for a minimum of eight hours before use to maintain quality. The solder paste should be mixed before use to ensure even distribution of any separated material throughout the paste. Mixing can be carried out manually or automatically for a duration of between one to three minutes. As a general rule, solder paste that has been in use for more than 8 hours should be disposed of. Solder paste which has been in use for up to 4 hrs can be stored for up to 24 hours in a sealed container at room temperature before being re-used. The working environment (ambient temperature and relative humidity) will affect the performance and so to be sure of the condition of the solder paste a simple coalescence test can be carried out. To verify the process, automatic inspection can be used to accurately check solder paste deposits. There are two types of solder paste inspection available which are 2D inspection which checks the area of the paste deposit and 3D inspection which checks the volume of the paste deposit. This is the target condition. 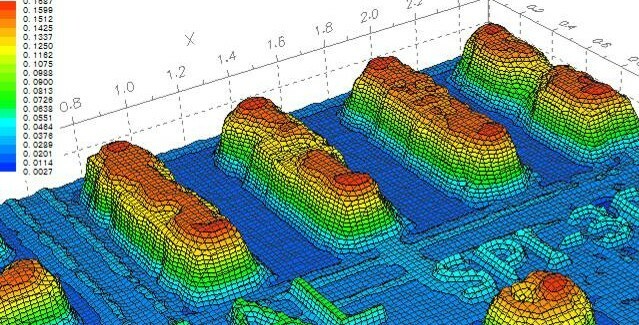 The 'Slumped print' typically occurs in a process that is run at temperatures above the recommend level. The 'Scavenged print' result is what can be seen if the squeegee pressure is set too high and 'Scooping' occurs. 'Bridging' can be as a result of poor board support or stencil condition/cleanliness. 'Peaking' is generally noticed when the stencil separation speed is set too high. The printing stage of the assembly process is vitally important. If there are errors introduced at this stage there will be “knock on” effects throughout the process. A cause and effect diagram can be seen here relating to solder paste transfer efficiency. To develop the optimum solder paste printing process it is essential to consider all aspects of the process detailed above.